Introductory Price special for you! For larger or multiple orders of brownies, please REPEAT your order until you achieve the total quantity desired. You will be able to designate different recipients for each and every item ordered at checkout. Offer cannot be combined with any other discounts. Shipping & applicable sales taxes not included. Sale Ends Midnight, Tuesday, February 12 2019. 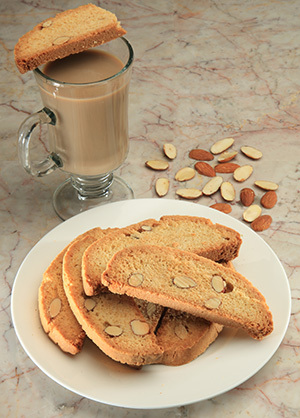 1 Dozen Chocolate Chunk Biscotti - ONLY $12.99 - SAVE $11.00 . . . . Offer cannot be combined with any other discounts. Each Biscotti weigh almost 3 ounces making your pleasure twice as great. Hand-cut chunks of incredibly rich Valrhona couveture chocolate are added to Ruth's Own classic biscotti recipe to make this a clear favorite. REGULAR PRICE $23.99 - SAVE $11.00! 1 Dozen Gluten Free Brownies - ONLY $25.99 - SAVE $23.00 . . . . . . . . Offer cannot be combined with any other discounts.